We knew it was an inevitability. Not only because he lived to the ripe age of 91, but also because the man himself spent a good portion of his illustrious career reminding us that death was an unavoidable reality. Don't squander your time because you have only a finite amount of it. You are here and it is now, so Live! You could feel it thrumming in the page ink like a live wire, spitting out sparks when you read that scene or met that character, and then all at once you felt as though Bradbury was somehow at your elbow, seeing you and seeing into you. He lived in the same world you did, only he knew it better than you and had come to show just how rich and chilling and strange and magical Life is. His words sang. Sometimes the song was akin to Beethoven's Ode to Joy. Other times it was elegiac. But there was always rhythm there, always the emotive power of music that the audience felt. ("Feel, don't think" was one of Ray's favourite tips). 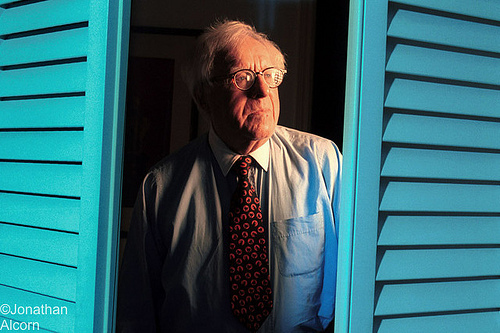 Almost everyone who reads fiction has a favourite Ray Bradbury story. Even people whose interests lie well outside of genre writing or fandom know of the man, or at the very least know his name. That's because Bradbury's work truly transcended categorization. I emphasize truly because there are scads of writers who think they hover above pigeonholes, but Ray Bradbury actually did. His writing was sui generis. No one wrote that way before him and any writer who attempted to follow his giant footprints inevitably face-planted in their own pastiche. 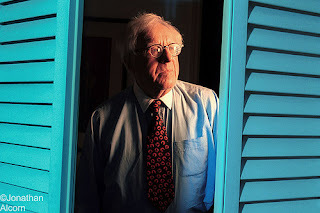 My Ray Bradbury was, is, and forever shall be the October Bradbury. The Bradbury of "The Scythe" and "The Jar" and "Cistern" and "Banshee" and "Usher II." The Bradbuy who manned the black Ferris in Something Wicked This Way Comes and tended the gourd constellations of The Halloween Tree and architected the ghoulish family reunion in From the Dust Returned. That is my Ray Bradbury. Not only because in him I found another who loved foghorns, the autumnal, attic dust, mummies, cellars and cold dark lakes as much as I did growing up (and still do), but also because this man wrote paeans to these things. His Horror fiction did what I later strove to make my own do: chill you, yes, but also show that these atmospheres, these macabre images, are beautiful things. Magical things. Things that are often good for you. Oddly, I am not one of those fans who has a salient memory of the first time they read Ray Bradbury. Even my recollections of how I discovered his work are hazy. He was just always there, a presence in the world whose name I would see on spines in libraries and bookstores, whose face I would spot on television, whose voice would occasionally filter through my radio. He was Ray Bradbury. Our mythmaker. The Tigris-Euphrates of 20th and 21st Century speculative literature. Ray was our fountainhead, and for seventy-plus years we writers of the dark and the stars and the distant lands acted as water-gatherers who collected Bradbury's runoff and used it to nourish our own blossoming voices. Yes, he was a presence. And now that presence is gone. So while we knew it had to come, and likely soon (for just as our living years are limited, so too is Death's patience), I find little solace in the logic of inevitability. 91 was too soon. Writers die all the time, but Ray's passing has altered the landscape in a colossal way. He was not a pebble in the ocean of words. He was a mountain in whose shadow we all grew up and drew comfort from. Yesterday we woke up and discovered that the mountain had vanished, leaving a massive cavity in our world and in our hearts. In Ontario, where I live, it rained yesterday afternoon. The storm was brief, but potent enough for the sky to swell with mushrooms of black clouds and flicker with raw lightning. I stopped and I watched it. Bradbury weather. That's what Ray is to me, will always be to me; a force of nature; something elemental; something that causes me to stop and wake up and look around and Live. And so I do. As does Ray Bradbury. No longer in flesh and bone, but in words and in the rustle of brown leaves and the scent of woodsmoke and in the glow of jack-o-lanterns.